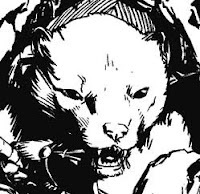 David Petersen: Alex, fans of Mouse Guard may not be as familiar with your name as some of the other creators on Legends of the Guard. Let’s correct that. Tell us about yourself and your work. Alex Kain: By day I'm a video game designer and writer for Venan Entertainment, Inc, a small studio in Connecticut. Since I joined up with Venan, I've helped design over a dozen games ranging from NBA LIVE and Monopoly on the iPhone to Ninjatown on the Nintendo DS. Recently, I served as a designer and lead writer for the iPhone game "Space Miner: Space Ore Bust". By night, I'm usually working on comic-related side projects. I wrote a lot of standard novel-format stories in high school and college, but nothing has ever been quite so rewarding as seeing those stories come to life in comic book form. David: Alex, with background is in video game design. In what ways do your game designer skills coincide with writing a 10 page comic story? Alex: I was actually pretty surprised when I found out there were quite a few similarities between comic writing and game design! Most of the material I write for Venan has to fit comfortably on very tiny screens, so that's taught me to keep things short. Altogether a pretty handy frame of mind to be in when you're writing a script for equally-restrictive comic panels. Whether it's comparing comic panels to tiny tutorial pop-ups or page counts to memory limitations, comics and games require creativity in how we approach these restrictions. Another thing I brought over from my design work is that I try not to get too attached to anything I write - things are constantly changing and improving, and the story has to move quickly to keep up with the rest of the production. David: Sean, tell us about yourself. You are known for your work on Redwall, but tell us more. Where did you go to school? How did you ‘break in’ to illustration? Sean: Well, I had planned on going to art school for most of my childhood, but when I started talking to illustration professors, many of them thought that my interests were too diverse for me to be a happy conservatory student. After a series of unlikely events, I wound up studying archeology at Princeton. I realized pretty quickly that my interests were also too diverse for me to be a happy investment banker or lawyer, so I just took the most interesting courses I could find and kept drawing. 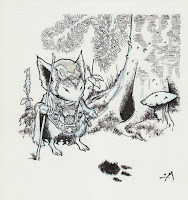 I actually started illustrating when I was a teenager, after I showed Brian Jacques some of my art at a book signing. He asked me to send art to his website and I contributed there pro-bono until some opportunities opened up with his audio books. Before then, I drew characters from books because it was just something I liked to do; that someone would hire me to do this seemed like a miracle. Brian and I stayed in touch, and whenever I'd see his publishers at events, I'd half-jokingly ask when they were going to give me more projects. 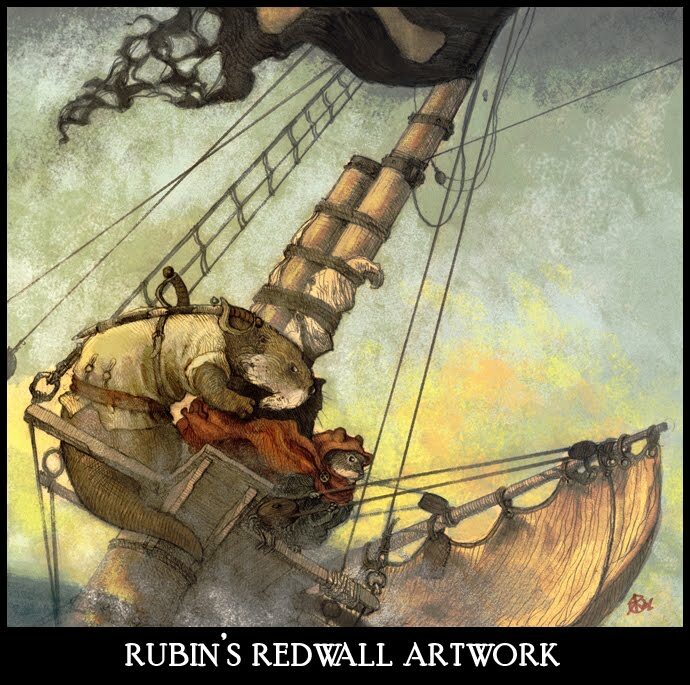 Later, when Penguin needed a new Redwall illustrator, I was asked to take over from David Elliot. David: Sean, with your connection to the mouse property-Redwall. 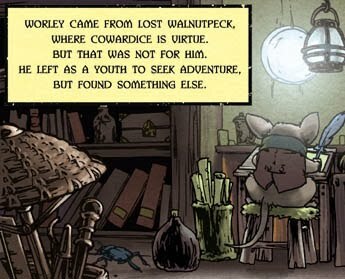 Did you have any nervousness or hesitation to work on a Mouse Guard story since there seems to be a silly stigma of there being room for only 1 mouse-with-swords property? Sean: That's a good question. 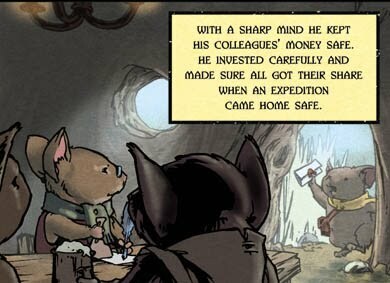 I think a lot of people would be surprised to see a Redwall artist doing Mouse Guard on the assumption that we're competing. I admit I don't see it that way, probably because I came to both Redwall and Mouse Guard as a reader first. In that sense, I'm just an incredibly fortunate fan who's been blessed with the opportunity to work in two properties I enjoy and admire. If anything, I hope this collaboration will expose more Redwall fans to Mouse Guard and vice-versa. David: How did you guys meet? Alex: Well, I was a freshman in college at the time and I had this crazy idea to design a Redwall video game. This was back before I knew much of anything about proper game design, but I dove into the idea headlong regardless. Eventually I needed an artist to do concept material. 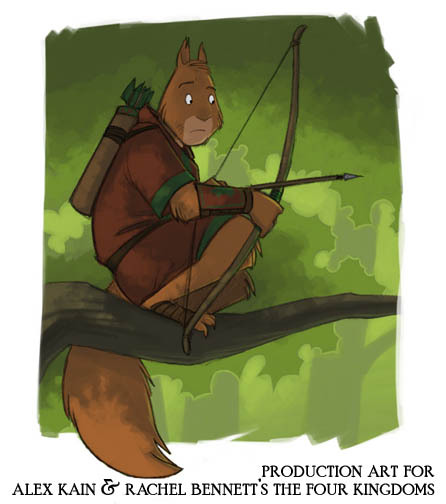 Sean and I were introduced on a Redwall internet fan board completely by coincidence and, hearing he was an artist, I asked if he was interested in doing concept artwork for my Redwall game pitch. "He's not that kind of an artist," I was told. Fortunately, that didn't stop Sean from getting involved in the project. Sean: Don't agree to draw for people you meet on the Internet, kids. David: What was the process for the creation of your story? Did you collaborate on the concept? Or were the duties divided up where Alex concerned himself with concept, story, and words, and Sean focused on the artwork? Alex: Yes, well, the first and last part of the equation in that cartoon look very wordy (or number-y, I suppose), while the missing part in the middle looks like it might do better with an artist's touch. Sean would refer to that cartoon, then I'd refer to how Michael Bay's screenwriters would just write "action scene" in the scripts for his movies, and then Bay would fill in the gaps with explosions. Writing pages of very specific action cues never really feels right to me. I feel like I'm restricting the artist in a scene where they really should be absolutely free to do whatever they want. The actual creation process for the story itself was pretty straightforward, actually. I wrote up three very different stories, and we picked the one we liked the most. The first two were pretty low-key dramatic pieces, not a whole lot of action to them at all. The third one was coincidentally the one with the huge "Shadow of the Colossus"-esque action sequence. We went with that! David: Where did your story (about a very small town, bravery, dedication, and mentoring) come from? Was it personal? 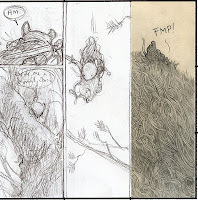 Alex: The story's themes of bravery, dedication, and mentoring were less personal and more about analyzing what makes the Mouse Guard world interesting from a storytelling perspective - here is a group of mice trying to hold together this fraying society while a large chunk of the population is oblivious to what's going on outside their borders. It's a perfect world in which to write flawed heroes and naive apprentices. Sean: I liked the story immediately. Looking back this might be because I'm a high school teacher. The first thing you can hope for as a teacher is that you set a good example, but the best thing you hope for is that your example will be followed. Other than that, "potential" might well be the theme of Alex and my friendship. We were kids when we met each other, but we kept working together because we saw potential in each other and in what we were doing. David: Was the story developed to include things you both feel you do well? Were there scenes or dialogue bits that leaned towards Alex’s strengths? And were there settings or things that were included because they are Sean’s forte? Sean: We had a joke about making a checklist of things I like to draw before we started. It sounds silly, but I think a lot of artists work this way. For example, I love drawing books and architecture, so we decided to represent Barkhamsted through a library. Certain items or settings may also look a bit Redwally, and that may or may not be on purpose. Alex: I do recall that checklist! "Need rope, need a library, needs to take place around the wintertime, etc." It wasn't a bad checklist by any stretch - trying to include everything was a fun little challenge. When I wrote up the three story ideas, each one represented a type of story that I like to write. This being one of the best opportunities I've ever had to write a short story, I wanted to make sure I focused on characters I was familiar with and a plot that was simple enough to withstand the twisting and compression that accompanies turning a script into comic panels. Sean gave me a lot of leeway in the writing process, and I gave him a lot of leeway in the drawing process, so we could focus on our individual strengths. 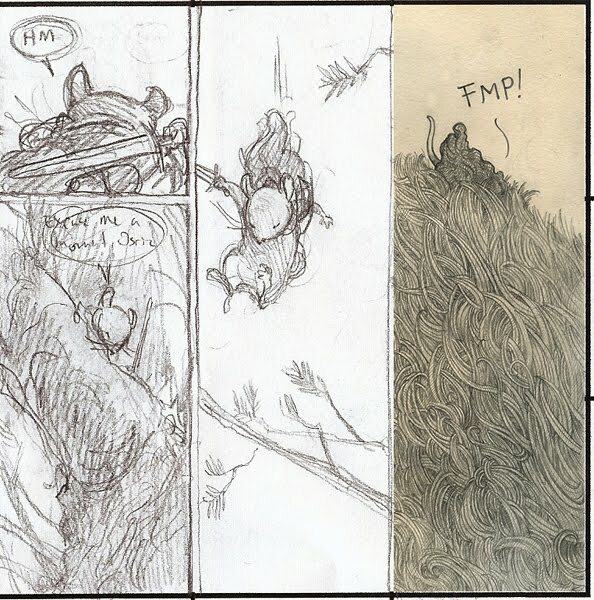 David: At one point in the thumbnailing process, you encountered a problem where the story needed to spill on to another page (which recently happened to me on the Mouse Guard FCBD story). Unfortunately, the rest of the issue’s page counts were locked in and couldn't be adjusted. So talk about how frustrating that was (or wasn't) and how you tackled getting the story to fit. Alex: Well, it's certainly something I'm familiar with in the gaming industry - some text won't fit in a box or a conversation goes on for too long, stuff like that. When it's just me going into a text file and editing things, that's easy. But introducing the whole "artist" side into the equation really made things interesting. Sean and I worked for quite a bit on condensing the action, re-writing the ending, trying to fit an 11 or 12 page story into 10 pages. Sean: Originally we had an extra page in the beginning to create more anticipation with the action. Between pulling a page of waiting and pulling a page of action, we decided to pull a page of waiting. This gave us more room to reveal the beast gradually, and to concentrate on a visual conceit that we really liked. We decided early on that a mouse would never be able to see the entire form of a much larger animal at close distance. I started thinking of Christopher Nolan's cinematography for Batman Begins--by keeping the camera very close to the combat, you get the crook's perspective of not knowing what's beating the tar out of him. In our case, the mouse can't see the entire beast and the beast is too large to interact with the mouse, so there's a confusion that goes both ways. David: Alex, how do you approach dialogue? How do you ensure that characters have unique voices or that the speech reads clearly and naturally? Alex: Whenever I write a scene with characters, I'm usually just improvising the dialog, letting the scene play out in my head and hoping my typing fingers can keep up with my brain. After that, I go through and break the scene down, I try to add witticisms and appropriate banter where possible, and then act the scene out. I acted quite a bit in high school, lots of plays and musicals and whatnot. I think that's very important in any medium where you're trying to portray dialog between fictitious individuals. When it comes to actually creating those individuals, I draw inspiration from people I know - childhood friends, mentors, bullies, etc - and use them to round out the characters' motivations. Every character I write has a backstory and a motivation - I like to know them, even if they're fictitious. It's like I'm preparing to act as them in a play - it helps me improvise dialog for them in their voice, and that really helps the dialog flow naturally. David: Sean, Talk about how you draw, what tools do you use? And how do you color you work? Sean: I use 0.3 mm graphite on Strathmore 400 drawing paper, which I like because it scans with a nice, creamy color. 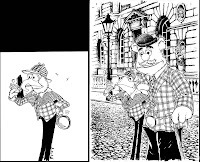 I draw object or character outlines first and shade them by cross hatching. Hatching is extremely time consuming, but I love the look it gives you. I've tried other techniques but I always come back to it. After that, the scanned drawings are colored in Photoshop, using semi-transparent layers to tint the pencil lines. I have a really research-heavy process, which for this project meant rambling in the woods during a weekend in Pennsylvania. I also contacted the Princeton Plasma Physics lab about shrinking me down to mouse-size, but they haven't returned my calls or emails. David: Well thank you both very much for your story and taking time to share about the process! Where can fans find more about each of you and your work? Alex: Thank you, David! Working with you and your world has been an enlightening and altogether spectacular experience. I just started a new blog recently at alexkain.blogspot.com. It's fairly new, but people can check it out for posts on this project, as well as others I'm working on. Folks can also follow me on Twitter (@tdcpresents). Sean: Thank you, David! 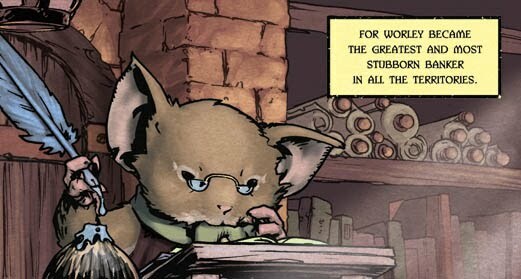 Working in your Mouse Guard universe has been an honor. I keep a blog at seanrubin.blogspot.com, right now it's an even mix of art posts and thoughts on teaching. I'm also on twitter (@seanrubin). Sean & Alex's story 'Potential' appears in Legends of the Guard issue 2 in stores June 23rd. David Petersen: Gene, you were very excited about Legends and knew you wanted on board with Lowell. (in fact, you were one of the most aggressive creators to be a part of the series…not long after we first chatted you emailed samples of your animal drawings, color work, Lowell’s writing…) Why was this a project you pursued? 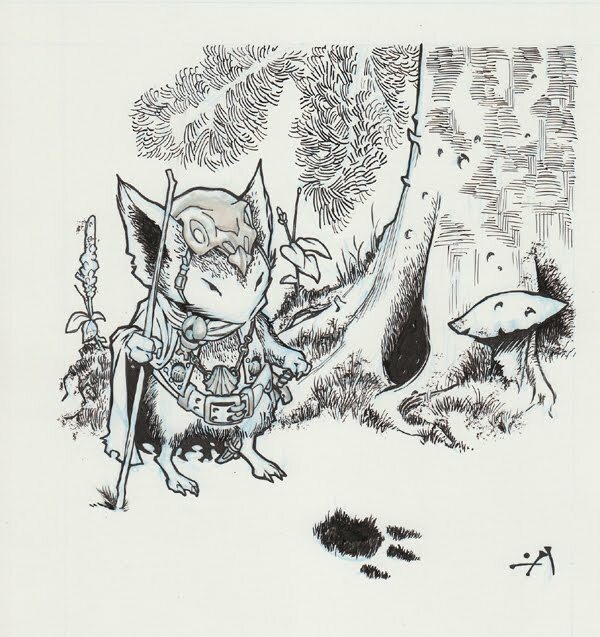 Gene Ha: I'm a big fan of Mouse Guard, as are my other comic geek friends. When you told me [about Legends of the Guard] I jumped at the opportunity. 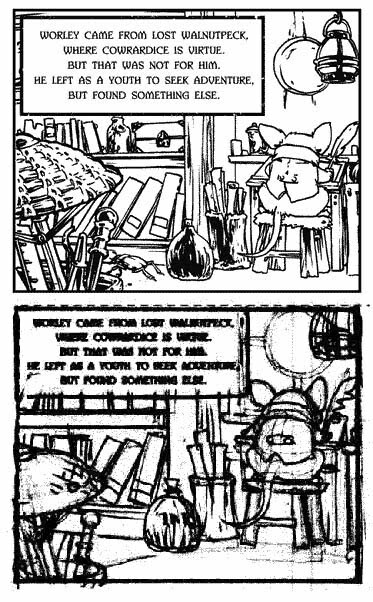 I wanted to work on a story with my friend Lowell, I'd love to draw mice again (hyper- or not), and I love the Mouse Guard setting. Thanks for letting me into your playground! Lowell Francis: Gene emailed me after he talked to you and told me the premise of the project- a kind of Canterbury Tales in the Mouse Guard setting. I thought that was pretty brilliant, working with folk tale forms. It also opens a window into other areas of the setting-- people, places and professions we might not otherwise see. David: So you two were the first duo selected for Legends of the Guard. I had planned on the creators being artist/writer all in one, but decided after you two and a few others asked, we could make some exceptions. Have you two collaborated together before? Lowell: We've worked together on a number of project proposals in the past and we've been playing with a webcomics idea more recently. Gene and I are also both role-play gamers and we bounce ideas and concepts off each on that side just as frequently. Gene's a great sounding board for plots, concepts and mechanics. He always sees things that I hadn't when putting together the initial premise. Gene: I've since learned I didn't have to, but one of the samples I sent to David was 3 pages from the tale of a lab animal squirrel living in a steampunk wizard's lab. That was from a game idea of Lowell's, and I asked him to write me a bit of script. We've also done a 4 page story about the Biblical hero Samson for the Hero Initiative fundraising book Hero Comics. David: How did your collaboration work? When picking out the story idea did you both work on it together? Did Lowell get involved in panel layouts? Did Gene make decisions about phrasing or how scenes would play out? And how did you communicate mainly? by email, phone, skype…? Lowell: Gene told me the initial premise and let me brainstorm for a bit and them come back to him. I remembered a side comment in the Mouse Guard rpg which mentioned that some smiths among the mice valued their hands so highly they took out insurance policies with local banks. I loved that idea and wanted to do something, which eventually evolved into considering the kinds of tales which merchant and banker mice tell-- a very different kind of hero. I'm interested in cultural history and I looked at some things like Verdon's Night in the Middle Ages for ideas, but ultimately I wanted which felt like a tavern tale. I like the idea that there exists a whole cycle of stories about this character, Worley, and we show just one of them. For scripting, I did a kind of page beat breakdown, then a preliminary script which Gene made suggestions about: resorting and adding elements. He suggested bringing a background character forward which ended up changing the ending and tying things together really well. Gene's an amazing designer so I leave most of the graphic elements open- I just try to describe the key element to be conveyed (I hope!). Gene: We mostly communicate by email, with phone calls if I need to get a feel for what he's thinking. Every now and then I'll drop by his town to hang out, talk ideas, and game. For the look of the book, I just swiped as much from David's stories as I could. I knew it wouldn't look like your work at all in the end because I can't draw like you. The I used your nine-panel grid for laying out my panels, though I sometimes broke a bit away. 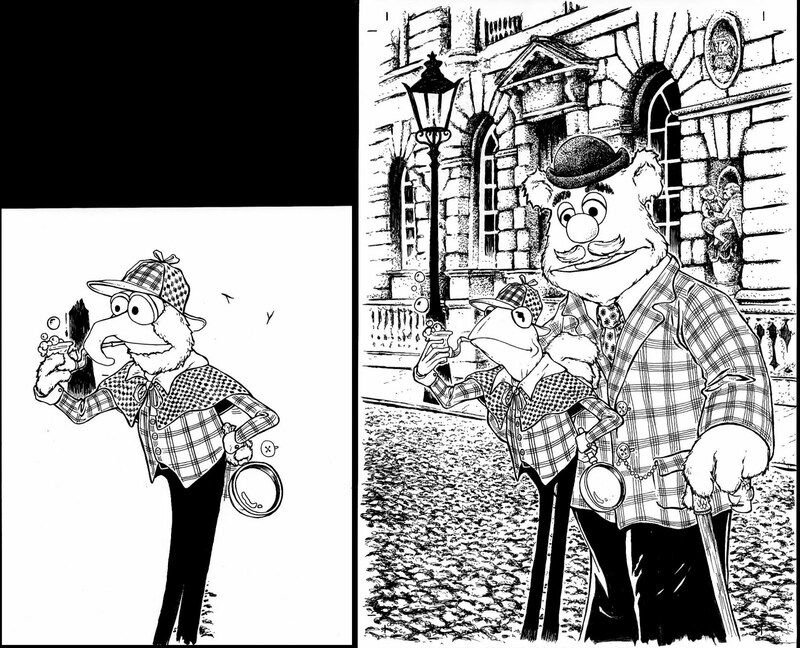 For the character designs, I acted as if your books are photographs and I was doing a stylized version of it. David and I had an amusing Facebook conversation about why his mice have two fingers and a thumb, instead of the traditional three fingers and a thumb of cartoon mice. 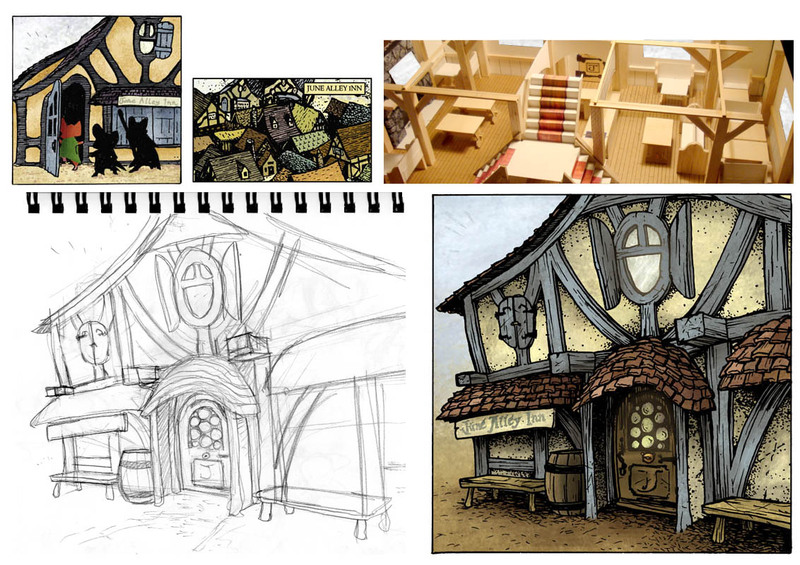 For the design of Wolfepointe, I ran with Lowell's idea of it being a rough frontier town. What trade goods does a town like that make, and what does is it need from civilization? Because the Scent Border keeps out large mammals, I figured they'd harvest things from across the border. Shed antlers, bones and claws and teeth from carcasses, urine soaked bark from marked trees, and other nasty bits. The Wolfepointe armor and halberds are made from bear claws. Their totem poles are gnawed from antlers. Antler is a great source of calcium for mice so I made them bigger than other mice. It all made a nice contrast with Worley the banker. David: How did you two meet? Gene: School. Lowell was the best read geek in Clay Middle School, and one of the most creative. He had a whole circle of often older comic and gamer geeks around him, and I got drawn into his circle. His tastes were really mature for a young teen. He introduced me to Alan Moore, Frank Miller, British comics, and art cinema. Lowell: We had a number of classes together; I remember playing games at the back of the room when we could get away with it. Gene and I were in the school Improv group as well. Gene was one of the few people to get how crazy and cool Alan Moore's run on Swamp Thing was. He also gave me my first taste of manga, long before anyone was putting out translations here in the States. That really affected the way I saw comics. Gene: I still go to Lowell and his wife for advice on movies, comics and music. He's got great taste. David: Was working on the Legends story different from the way you both normally work? Gene: Almost all of my work is for the big publishers, DC and Marvel. The freedom on this is exhilarating. I thought you'd keep a tighter rein on your 'universe' but you've been very encouraging. It helps that it's a legendary story. Lowell and I have pitched ideas for new books to DC, but it never worked out. Someone else always seems to have dibs on even minor characters. Lowell: I think we followed our usual route: we begin with an initial idea and then Gene lets me chew over it for a while. Then I come back to him, we bounce things again and then I walk away to do some more chewing on it. Gene's amazing at spinning things out off the top of his head, and I like to spend some time fitting things into position, like a puzzle. Gene: I come up with ideas, but I can't make different voices for dialog and a sound story arc. Lowell understands people better than I do, which is why he writes well and I can't. When I blather about comics storytelling, I'll inevitably start talking about neural function and the different brain visual centers. Lowell's the human half of our team. Gene: It is different, but it really fits the world just right. The mice live very close to the ground, where even tree roots dominate their landscape. Having a lower shorter page reinforces that. One has to use fewer panels than a bigger page. I like that. It's also harder to end a page with a big panel, but it can be done. Lowell: I tend to think in terms of points to be made on each page. I know if I put those out there Gene will come up with a way to visually organize the page and panels. And I know when I see what he's done it will feel right and inevitable. David: Where did the inspiration for your Legends story come from? Were there specific elements you guys were including just to draw or to write about them? Lowell: I really wanted to see Gene draw a Mink. 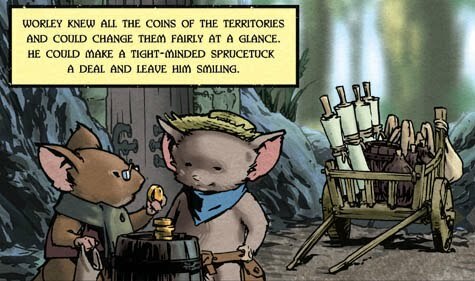 And I wanted to pick a wild and far distant Mouse settlement we could play with, which is how we ended up with Wolfepointe. I crossed that with my desire to have a merchant mouse folk hero. Gene: I was very hands off at first. My initial idea was to do a tale of dashing swordsmice, but I kept my mouth shut till he had time to think it over. I'm glad I did. A banker in the wilderness was great fun to draw. David: Gene, can you talk about your process of getting a page from a script to scanable artwork? Gene: After I get a script, I'll make 'thumbnail' sketches in the margins, literally the size of a thumbnail. I'll do one for each panel, including only essential elements like major characters, dialog, and background elements crucial to the story. Then I'll do a pencil layout about 3" wide. This gets scanned and printed as a 'blueline', on which I'll do my inks. At this point, I do my inks with a 2B pencil and Copic marker brushes. As long as I don't smear or overwork it, it scans really nicely as inks. David: And your color work has an interesting atmosphere. How much of the artistic work is done in the coloring stage? What do you use to color? Gene: When I'm doing my own color, it's important to plan what I want the final colored scene looks like. A lot of things, like hazy trees in the distance, aren't worth drawing in the inks. It will only hamper my colors. I'm better at painting trees than drawing them. I color in Photoshop. I've tried Corel Painter, but even on my shiny new Mac Pro it's too slow. I work at 900 dpi so the images can be printed as posters or 'Ultimate' editions later. To get my color palette, I'll either take a photo or find a Google image. I don't steal objects from the pictures, but I will use the eyedropper tool take colors for the sky, background, midground, and foreground. David: Where can Readers find out more about your work and various projects? Lowell: Gene and I have been playing around with a couple of future projects. 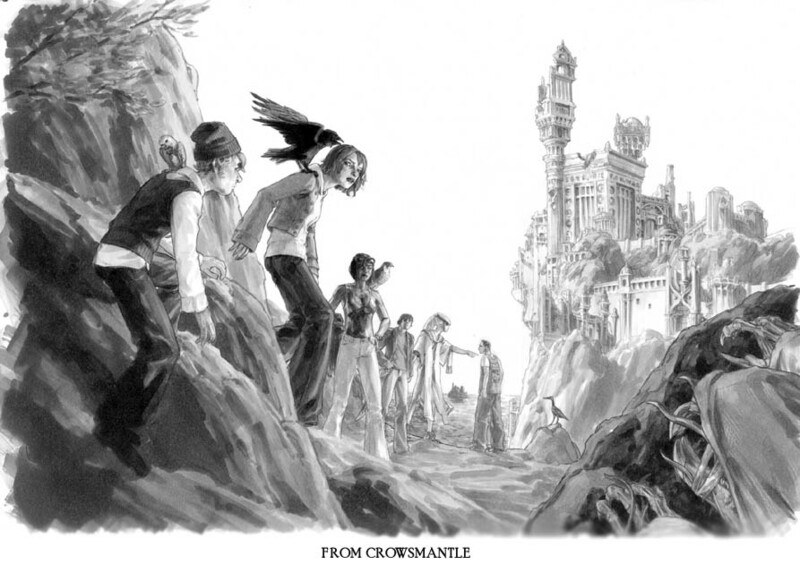 The first, Crowsmantle, is a longer form modern fantastic work. The second, Codici Malefactus (working title), is a kind of Harry Potter meets Rats of NIMH. Gene has some sketches from those you could post. I blog at http://ageofravens.blogspot.com/ about games and things, though I've taken March and April off from that. Gene & Lowell's story appears in Legends of the Guard issue 2 in stores June 23rd. I needed to do a spot illustration of the exterior of the June Alley Inn. While it has appeared twice in the comics from the outside (and only once on the inside) prior to Legends of the Guard, I reworked it's architecture to fit the needs of the Legends series. Once I changed the interior though, I needed to extend those changes to the exterior: door centered on building, no lower windows, 2nd floor large enough for tenant rooms, etc. I tried my best to honor the design I had used before (based heavily on a Storybook Style building in California) so that the new facade wouldn't be too jarring even to the most astute Mouse Guard fan. 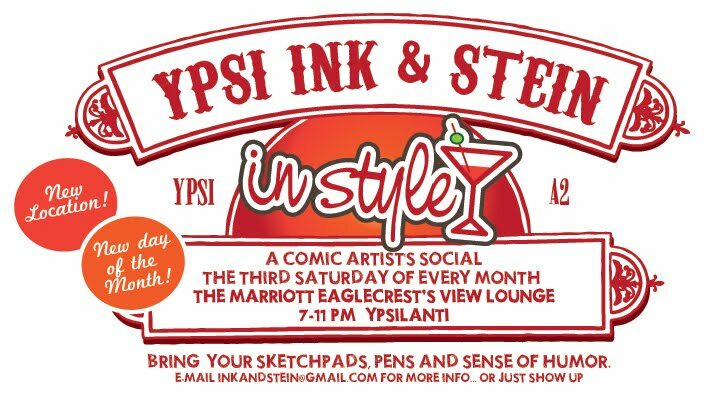 This Month's Ink & Stein will be this Saturday at the Marriott in Ypsilanti 7pm-12am. Artists of all kinds are welcome to join us socialize and work. The goal is to get us out of our studios to bounce ideas off one another, get to meet some new people, and perhaps have a cocktail or two. For the most part, we encourage you to bring your own work, but in the next few months we are going to try and organize a charity jam piece and perhaps a field trip to the zoo for some animal-life drawing. Ink & Stein Facebook page for the group and for this month's event so if you are interested feel free to touch base with us there. This week's Fan art is from Emma Lazauski who did some fun character drawings of Saxon, Celanawe, Kenzie, & Lieam. She has some lovely spot illustrations of other animal characters on her blog: http://oddsketch.blogspot.com/ Thanks Emma! 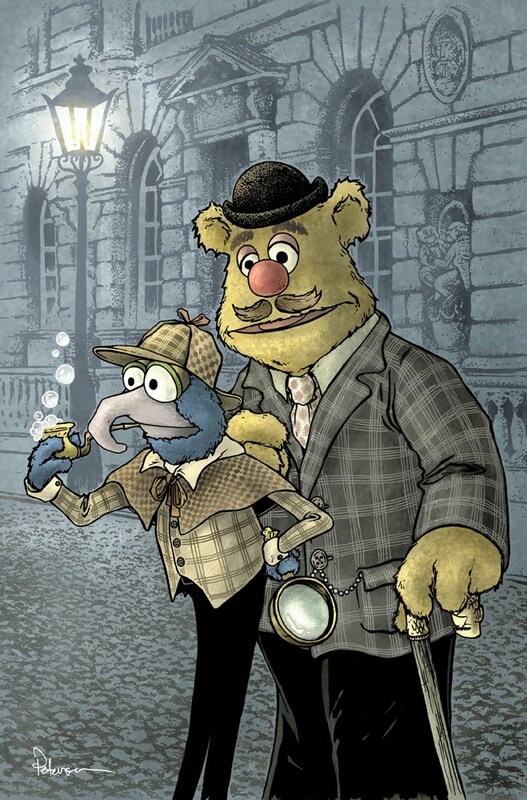 Some folks may have already seen cover artwork I did for Boom's upcoming Muppet Sherlock Holmes. However, what I originally drew is different than what you saw. When told the assignment, the casting had Kermit as Sherlock and Fozzie as Watson. I was busy and went radio-silent as I worked on my cover. I turned it in and found out that the casting had changed to Gonzo as Sherlock. With the artwork already colored I needed to patch in Gonzo without disturbing any more of the colored work than I had to. I went back to my original inkwork and used a lightbox to draw a Gonzo that would cover up as much of Kermit as possible. Because I had to change some of the pose (Gonzo's nose blocked the bubble pipe in it's original position, so I had to move his arm) there were some areas where Kermit would be exposed, so I had to draw new background on my patch. Scanning the Gonzo patch I placed it in my layered color file. I erased all the layers associated with Kermit as well as the Kermit line art. I colored Gonzo and used the eye dropper to get color matches where I was filling in exposed background and making a new color hold for the patched background. From a casting point of view I think I prefer Kermit as Sherlock (even though Gonzo is my favorite Muppet Show character), but I was able to give the handle of Gonzo's eyeglass a little chicken head motif and anytime I can do that it makes me happy. 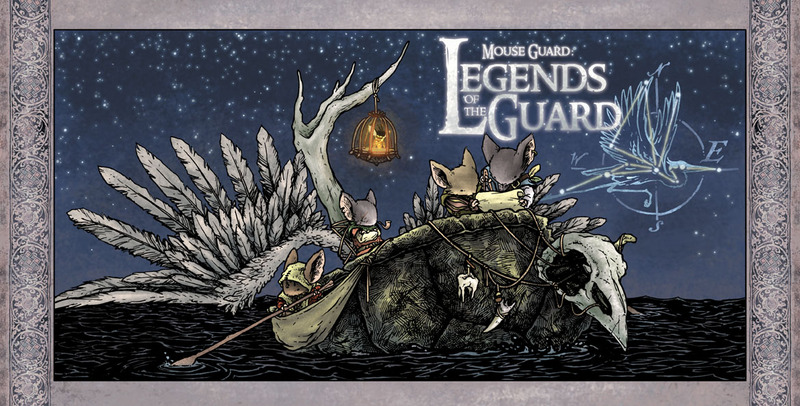 Legends of the GuardIssue 4 of the Mouse Guard Anthology is now in previews (order code: JUN10 0748). Here is the full cover for the issue. The covers all have 1 paragraph stories associated with them that are included in each issue. But more importantly, this issue will feature stories by Karl Kerschl, Craig Rousseau, & Mark Smylie! 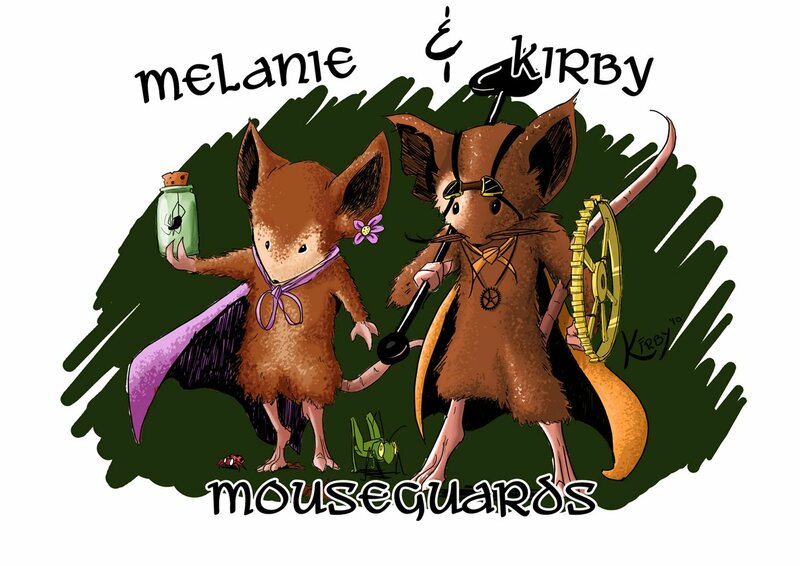 My friend, Melanie, and I were perusing around Forbidden Planet in Newcastle where I ended up picking up one of your Mouseguard books...Once I got back home I more or less immediately started sketching out some ideas for mouseguard characters... I couldn't pass up the opportunity to draw us out in all our small-statured glory! David Petersen: You and I have already talked about this subject a bit over the phone, so I know your answer, but will you share how you felt working on your Legends story was different than working on something of your own like Robotika? Alex Sheikman: There are a couple of nuances that made this very unique for me. First of all, because this is “legends” of Mouse Guard, rather than a story that is part of Mouse Guard continuity, I felt very free when I started thinking of possible storylines. Continuity can be the toughest part of any assignment (even when it’s your own creation), how to bring something new and fresh into an already established storyline…not having that in the mix, gave me all sorts of freedom. Secondly, the fact that Mouse Guard is so totally different from anything I have ever drawn before (animal based vs. humanoid based universe) made it very exciting. I got to take the principles that I have been studying, of storytelling, design, drawing and rendering and apply them to something new. This was fascinating for me, I saw things from a fresh perspective and that was very inspiring and pushed me even more to experiment with design. David: I think this is the first time you ever worked in the square format. How did you find it? Did it effect your panel arrangements or your go-to page layouts? Alex: The format definitely affected my page compositions. I still followed what I believe is good storytelling, but because of the different space allowed, the pages have a very unique look. It was like playing music in a different key, it is similar enough so that if you know how to play you know what to do, but different enough because you have to adjust the whole piece to make it sound right. I loved doing horizontal panels in this story. They really had a panoramic feel to them that was very cool. That is something that is very hard for me to capture when I work in the rectangular format. David: I have already seen your artwork for Legends, but I think the question applies to your Robotika work as well. In some panels you draw intricate backgrounds with lots of details. In others you simplify the backgrounds, and in some you omit or use stylized marks. What, as an artist and storyteller gives you cues for when to use which level of detail? Is it simply a graphic decision? Or is the story and dialogue giving you the cues? Alex: The backgrounds are the stage for the story and definitely have to serve the story and the storytelling. The reader should never be confused about the setting and the space through which the characters are moving. Having said that, I will also admit that I am in love with the turn of the century illustration and artist like J.C. Leyendecker and Orson Lowell who were able to describe the backgrounds/environments with just a few suggestive shapes and a couple of pen strokes, are fascinating to me. I want to understand it and I want to practice that. I have recently also been looking at syndicated strips by Al Williamson and some other great artists from the 60’s and I love how they were able to not only accurately depict the backgrounds, but also arrange everything to make each panel a very cool illustration. I want to understand that and practice that as well. My goal has been to be mindful of my depiction of backgrounds and to try to create a rhythm from panel to panel of how the environment is presented to the reader…and hope to make it look cool at the same time. So at times when I need to establish a scene, I try very hard to provide enough information to set everything up for the reader to see and if I have done that properly, and maybe want to increase drama/tension a few panels down the line, I might do a close-up of a character with the backgrounds replaced by graphic shapes that draw attention to the character or his/her actions. David: When you sent your Legends thumbnails over for me to look at, you had written in all the captions/dialogue. Did the words come with the pictures? Or did you figure out the text after thumb-nailing the story? Alex: As I am doing layouts, I am always thinking of compositions and how they will interact with captions/dialogue. As you and I talked about before, comics are a unique medium that creates a wonderful marriage between pictures and words. As I work on thumbnails, I try to always be aware of both elements, to make sure that the story is being told well, and that I am smoothly transitioning between panels, scenes, and pages. The text definitely got refined at the later stages, but the basics got put down at the same time as the initial scribbles. David: Since I didn’t give you a page cap, how did you determine when the story was done in terms of page count? Alex: This was something that I truly appreciated. With the freedom given, I just told the story the best way I thought it should be told. Turned into an oddball number of 9 pages, but I feel it’s just right. I don’t think this happens very often, there is usually a page cap that one has to work towards, so this was fun. David: When you are drawing, what types of materials are you using? Do you draw directly on the final page? 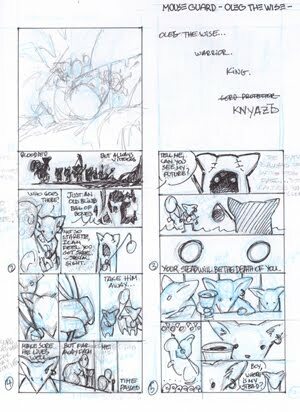 If so, how closely do you follow your roughs/thumbnails? Alex: My approach/technique is always changing. I have, in the past, drawn the different panels on separate pieces of paper and then re-traced everything onto one final board. I have also tried taking the roughs and blowing them up to trace on the final page. But I have felt that my drawings stiffen-up when I go through the tracing stage, so currently I use the roughs as a reference pined to my board and I simply start drawing right on the Bristol board. Since I ink all of my own work, I don’t have to worry about indicating line weights in my pencils (I implement that when I ink), therefore I enjoy using mechanical pencils for penciling. I move my hand over the drawing area a lot (my penciling is more like doodling a ton of lines and then erasing the “wrong” ones) and with tough leads, mechanical pencils hardly leave anything to smudge. David: Talk about your inking process. What do you use? (and when)? Do you work on contour lines first? Do you focus on composing your large black areas early or later? Alex: Inking is a subject dear to me. It is one of the stages of black/white drawing that I truly enjoy. I don’t know if it is because it is very technical and I enjoy the whole “what tool to use for this sort of job” thinking process or because the inking stage is the last step before you can see a complete drawing. A few years ago, I considered trying out for an inking position, but I found it hard to ink someone else’s pencils…I kept trying to “fix” the drawings (without even realizing it). In the end I learned some very valuable lessons, one of them being that I should stick to inking my own problematic pencils. As far as my process goes, I try to be very open minded when it comes to tools and techniques. I have a variety of tools near by (brushes, markers, dip pens, tooth brushes, bath sponges, cotton tips…) each one capable of making different marks and based on the desired effect I choose the tool that I feel is right. I usually try to finish all the penciling and figure out where my positive and negative spaces are, so when I start inking the basic design/composition/light-source is worked out and it is down to the mechanics of making ink marks/lines on paper. Because I am right handed and I try not to smudge wet ink, I almost always start at the upper left hand corner of a page/drawing and ink down diagonally or across to the right. I outline, but don’t fill in the black areas until the while page is done because I don’t want to wait for the ink to dry while I am still working on the page. David: I think that you are a real student of comics and comic storytelling Alex. With Robotika, you played with the medium in ways that, I think even you, considered an experiment (vertical lettering, the 3 parallel narratives in the end or Robotika v.2) talk about your outlook on experimenting in comics for good or bad. Alex: Thoughtful experimentation is always good. I try to be aware of how I tell stories and why, as a storyteller, I make the choices that I do. Staying aware throughout the whole process of what you are doing, why you are doing it, and how it will be interpreted by your readers (who can’t see inside your head and can only judge the work by what is presented to them) is important AND a challenge. The principles of storytelling in comics are similar to the storytelling principles in prose, cinema, music, dance, poetry, theater…each one is a unique medium with special needs and strengths. But in all of them, you can’t loose your audience just for the sake of an experiment in media…of course all rules are made to be broken, even that one. David: Where can people find out more about Alex Sheikman and Robotika? Legends of the Guard issue #1 in stores June 2nd!